Finding your public IP address is handy when you want to run a server at home to share with people on the internet (website hosting, file sharing, remote control, etc…). There are many ways to get it, but most of the time, they rely on reading information from a website such as What Is My IP, even a google search will return your address. Refer to man ping for more details, but -R triggers the routing trace option and -c 1 makes ping use only 1 packet so the command returns as quickly as possible. Alternatively, you could subscribe to a Dynamic DNS service and install a software that updates your IP address as it changes. That way, your server becomes accessible from the internet using a static hostname. 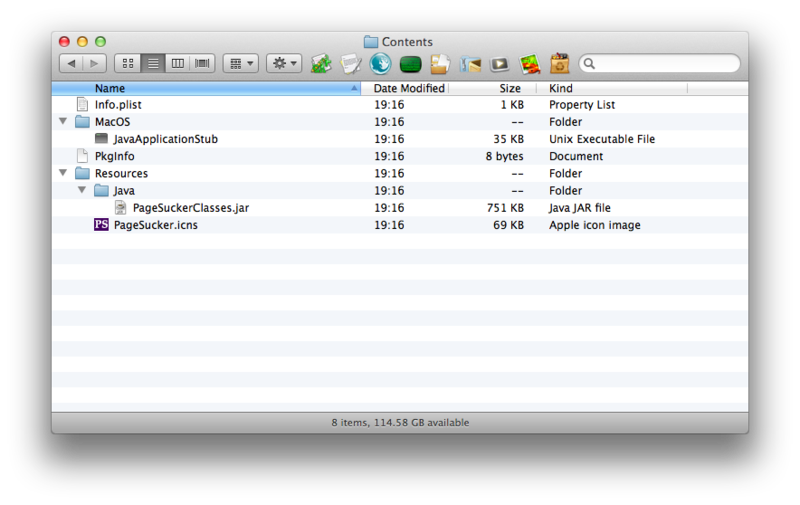 Apple’s developer tools come with a neat utility for bundling Java jar file into a Mac OS X application: Jar Bundler. 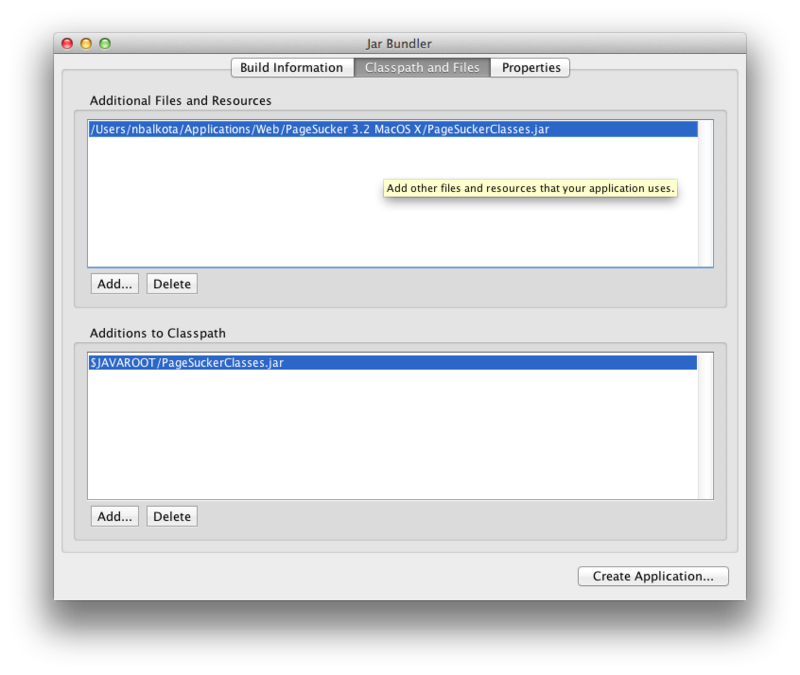 It can be found at /usr/share/java/Tools on Lion. First add your Jar file to the “Additional Files and Resources” panel. It should contain a Main Class (i.e. be a Java Application). 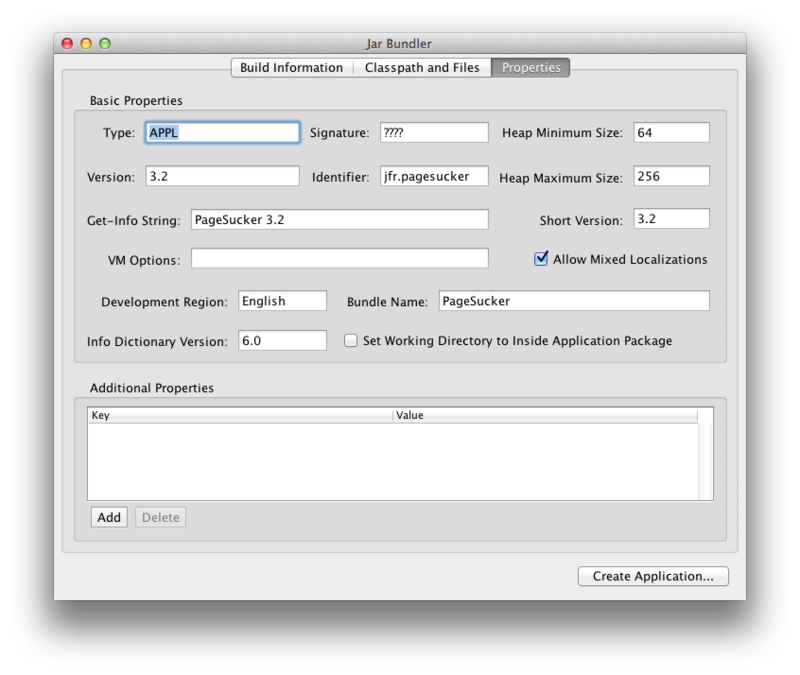 Specify the Java Main Class name and other Mac OS X specific options (e.g. 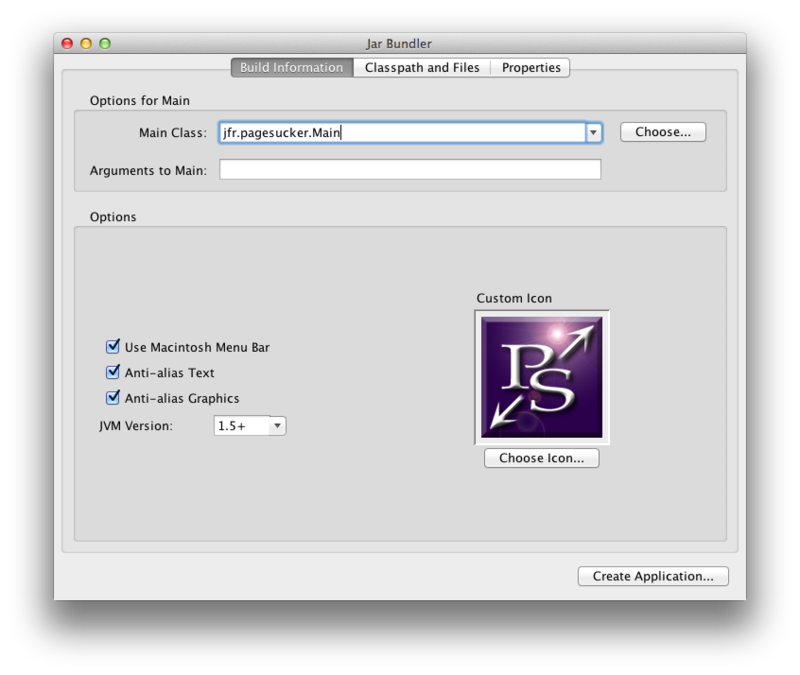 Application icon, whether Java Swing’s JMenuBar should use the Mac OS X menu bar…). Finally, specify other Application specific properties (e.g. version). You can also specify the JVM heap memory size (in MB) and other JVM options from here. There you go, here is the Package Contents of the resulting Mac OS X application! 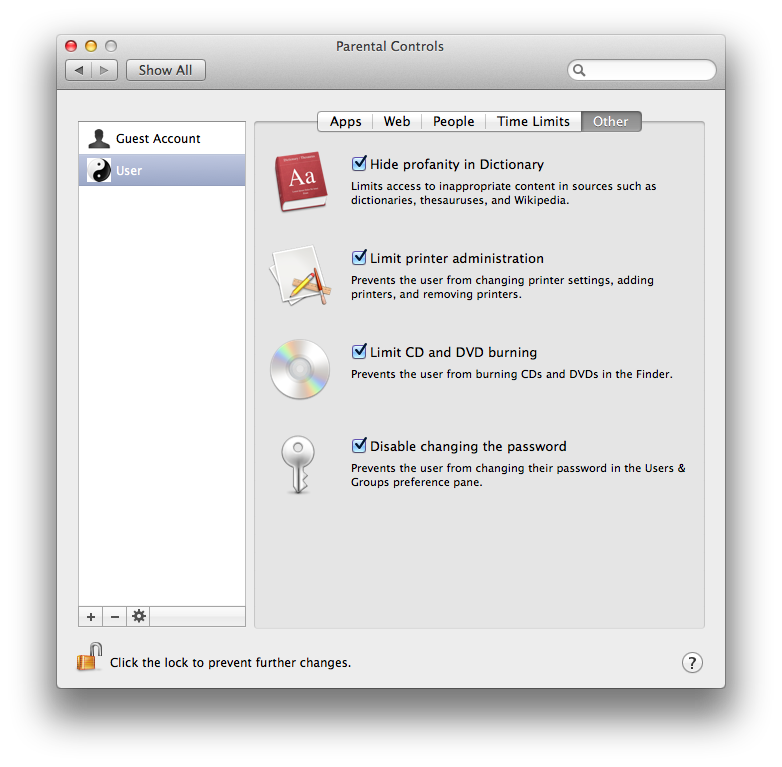 The resulting application is now well integrated into Mac OS X as shown in this Finder Get Info dialog. The Java app used in the above example is PageSucker. The latest version is 3.2 but only exists for Windows, Mac OS 9 (Classic) and Mac OS X, but for PowerPC only. Using the instructions in this post will allow you to create an Intel compatible application for Mac OS X (including Lion…). 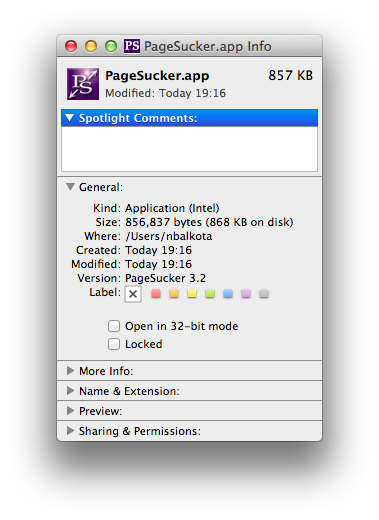 If you are lazy, you can get the version I did for Mac OS X 10.7 Lion: PageSucker.app.zip (not a real PDF, but a zip file…). Note: Period (.) represents the current date and time. Before Mac OS X Lion, in System Preferences > Sharing > File Sharing > Options… you had the option to use FTP to share your files. Note that this did not enable the FTP anonymous user, which needed some Terminal wizardry. Instead, you could use PureFTPd Manager to have a nice GUI to configure FTP with anonymous user access, but Lion is not supported (yet?). Since Mac OS X Lion, Apple removed the GUI to enable FTP file sharing. FTP protocol has probably been deemed too unsecure (your password string and any data would travel the ether without any encryption). What if I simply want a quick and easy way to share files with others without the need for an account or password? This is the whole point of setting up a FTP server with an anonymous user! So what’s the alternative for Lion’s users? Easy for the Terminal addicts, but like before via the GUI, FTP in Mac OS X still lacks an anonymous user (see man ftpd for more info). Luckily, for the rest of Mac users, there is a more secure protocol and it can be easily configured using only the System Preferences GUI. Simply create a standard user in the Users & Groups System Preference Pane. You can decide to set it with a password that you will share with others (e.g. the same as its userid). You can further limit what this user could do (particularly locally) by enabling Parental Controls (i.e. degrade it from standard to managed user). 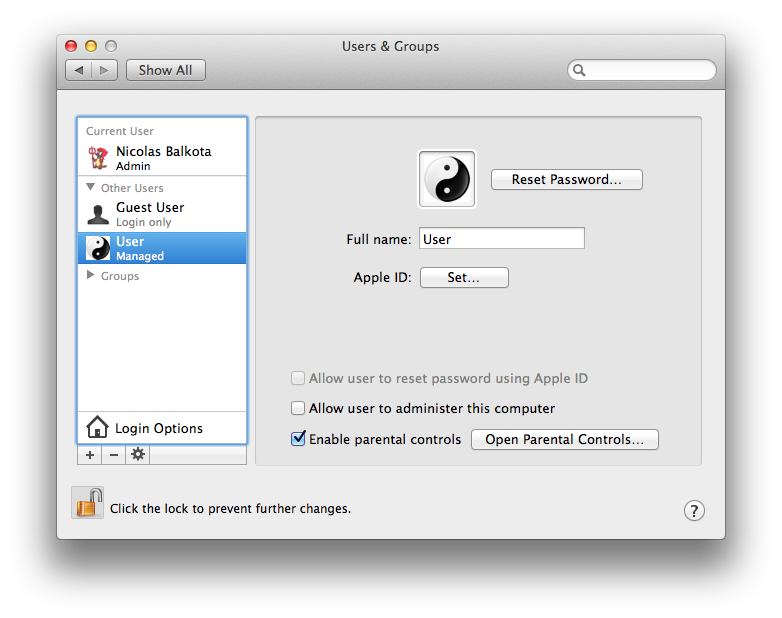 Finally, enable Remote Login in the Sharing Preference Pane. This will enable ssh remote login, but implicitly and more importantly for us: sftp. Others can now access the files held by user with the address sftp://user@<ip or hostname> or by using the equivalent command in a Terminal: sftp user@<ip or hostname>. 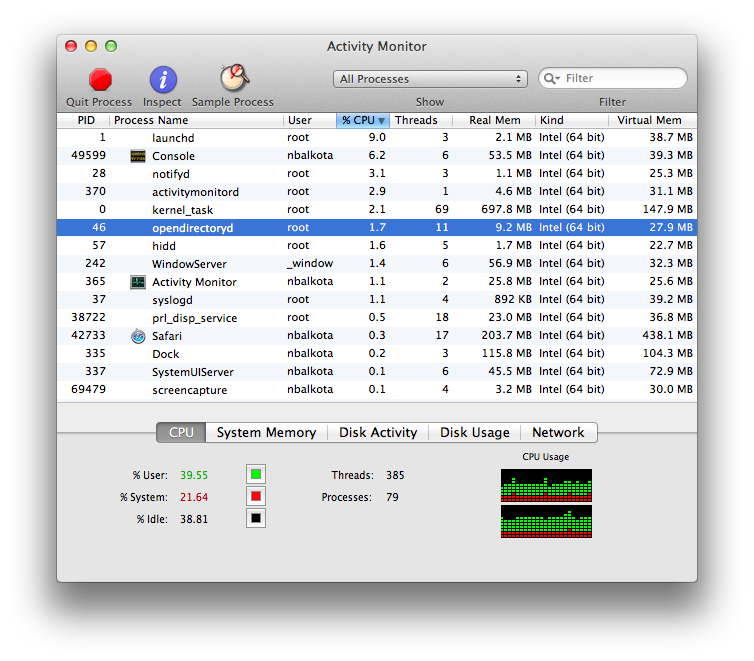 Mac OS X Lion – opendirectoryd bug? 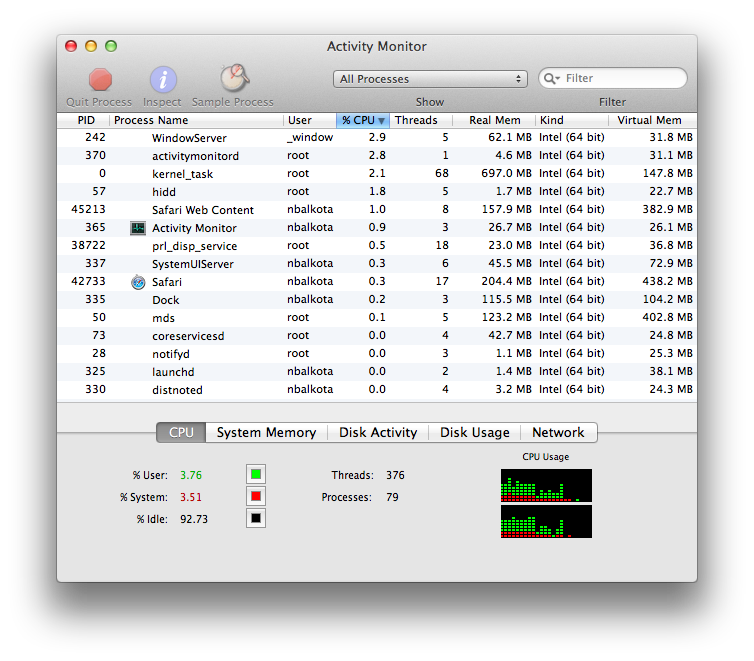 Activity Monitor showing higher than usual CPU usage. Note that the sum of highest % CPU Processes is less than the reported % User and % System combined. Oh my God!!! Terminal won’t even start! 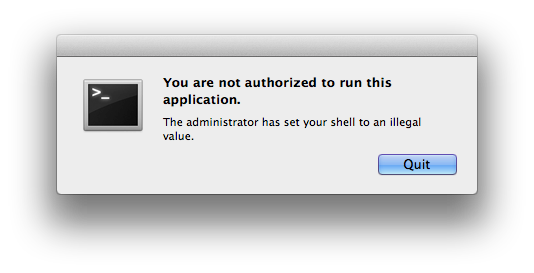 So, what is the way to deal with this until Apple issues a fix in a future update (this bug seems to have been fixed since Mac OS X Mountain Lion 10.8)? Well, if you had Activity Monitor or a Terminal running before the problem occurred, you can simply quit the process named opendirectoryd (it will be automatically restarted by launchd) and then magically, your Mac will behave normally again. Alternatively, switch user to kill opendirectoryd from the new session with administrative rights. 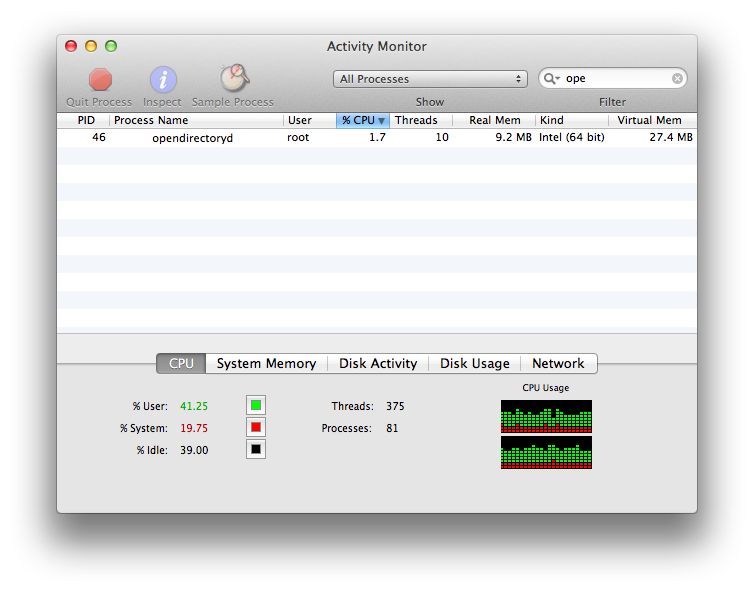 There you go, %CPU back to normal, opendirectoryd automatically restarted, your Mac is now back to normal.